You would think we would get it right by now. However, the more you know about the world, the more you realize the mess we’re in. I believe it’s important to involve ourselves in making this life a better experience for all. But, let’s face it, we need more than man’s abilities to correct all the problems. The Bible clearly reveals the mission of Jesus as two-fold: (1) to come to earth as a humble servant and die for the sins of the world, and (2) to come back to rule and reign over His creation. As a young believer, I often heard messages about the second coming of Christ. Books and movies about His soon return were also plentiful. But, interestingly, now few people seem to be talking about the return of Jesus—in spite of the fact that so many of His predictions are coming true right in our day. In Matthew 24 Jesus clearly taught us about His return. He did not give dates, but He wants us to focus on being ready for His return by our attitudes and lifestyle. 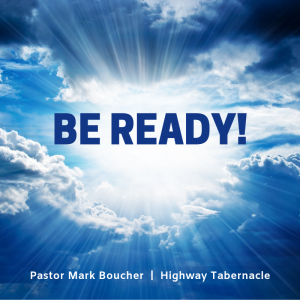 He said, “You also must be ready, because the Son of Man will come at an hour when you do not expect him” (Matthew 24:44). Jesus then goes on to describe the one who is ready as a “faithful and wise servant” (v. 45). This servant occupies her time by investing in helping others. On the other hand, Jesus warns us about a deadly attitude. “But suppose that servant is wicked and says to himself, ‘My master is staying away a long time, and begins to beat his fellow servants and to eat and drink with drunkards’” (v. 48). This servant will be judged severely and filled with extreme regret. So, Jesus presents us with two ways to live in light of His coming. We can choose to be faithful and responsible, knowing that we will give an account to Him, the owner of all. Or, we can throw our faith to the wind and live for our own selfish desires, not caring about who we hurt or the consequences. The one will receive honor and promotion, and the other will receive shame and regret. Choose well…Jesus is coming back!